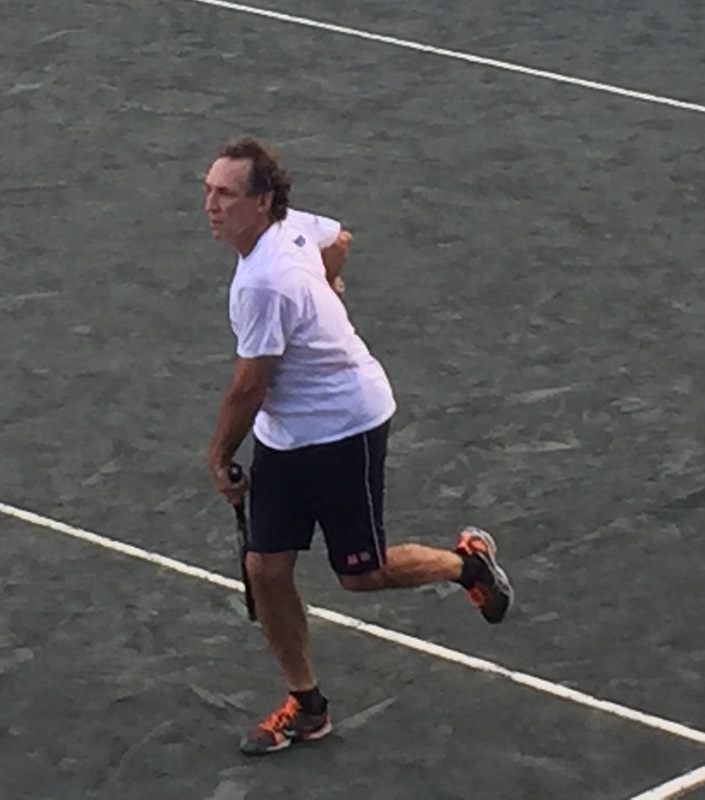 I played a long time friend, Michael Beautyman, in the quarterfinals on the hottest, most humid day of the week. The short story is that he got the better of me 4-6, 7-5, 6-2. Nearly 3 1/2 hours of lengthy rallies with major momentum swings throughout. In the end his fitness was better than mine. He crossed the finish line standing as I crawled across. Kudos to him. The story that I am feeling is that I won. I won in so many ways that the results faded quickly. I know that, when I play, it is always 50-50 in terms of outcome as we are all players in, roughly, the same level. I know that if I have ways of winning and competing that I can control, I have the best chance at getting the one part of which I have little control: the score. Yesterday I won on so many fronts that I had no regrets about missed opportunities that are always there in a long match against an equal. Sure, I missed some shots I might have made but I also made many shots I might have missed, so no regrets. The biggest challenge for me came in the second set. After winning the first set playing neutral, steady tennis, taking very little risk, Michael started to play better in that style than me. When playing neutral it is difficult to change style to being more aggressive. I got sucked into continuing to play neutral as he pulled away to a 4-0 lead in the second. Throughout out that 4 games I kept telling myself to step it up, to take chances. I was playing a losing game. Despite feeling exhausted from the long rallies, I finally took my own advice and started to attack. I ran around backhands and crunched forehands, almost carelessly. And I kept it up. It took a lot of pushing back against a story that was in my mind: play safe, you can work your way back into this match. I kept the better story going and, amazingly, won 5 games in a row as I was on fire. Serving for the match, I had a great chance to win the first point, which would have set the tone. But I missed an open court forehand, being aggressive. I stayed aggressive but the shots were not finding the right spots on the court and Michael toughed it out, won the set and cruised to win the third set and match. No regrets. I stayed with what had gotten me back into the match and my comeback was one of my best ever. The fact that I couldn’t maintain it for six straight games. Well, that is the game of tennis. The best part of the experience was how we were with each other after the handshake. We hugged, appreciating the experience. He reminded me that, a few years ago, I had told him that, at a time when his life was not where he wanted it to be but that he said that he always remembered it. He fell in love with a great woman and his life is so good now. And his tennis better than ever. He redefined winning. That was his best weapon and how he fought off the victory that I seemed destined to grab. I am so happy for my friend that he has found what I found. Many of my opponents have said that I have always had an unfair advantage because of the relationship I had with Carol and that I now have with Jo Ann. Angels on my shoulders. When my life is good, my tennis is good. One hour later I dragged myself out of a chair, feeling sore, stiff and tired and,with partner Les Buck, won the semis of the doubles. 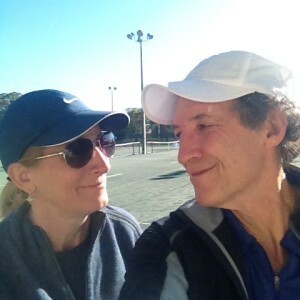 So after over five hours of brutal tennis it was a terrific tennis day. A singles loss that was a win. 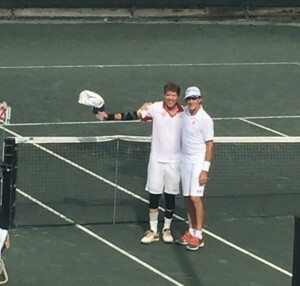 A doubles win that has Les and I playing today for the National Championship. A chance for a gold ball, emblamatic of winning a US National. else. Today I learned the emotion of “heart.” As always, thank you. Amazing. 3 1/2 hours! Good luck today Bob. Laissez le bon temps rouler! I’m pleased to be back on your list and being inspired by what and how you communicate, both on and off the court. Thank you. Congrats! Life is good for you and Jo Ann! Good luck today in the doubles final. Go get another gold ball! Awesome! Congrats on both or your wins yesterday – or maybe I should say “all” of your wins yesterday. Clearly you had a lot of them. And, best of luck today. Hey Bob – Congratulations on both of your wins today. With each blog I read, I learn a lot and grow some too. The learning comes quickly to my head while the growing part comes only after reworking and reforming old messages. From head to heart to hands is my process. well written, bob. i enjoyed listening. I frequently remind my students (as well as myself) that they can be successful, and still not win the match! Your comments are a “breath of fresh air” in a world often dominated by: Did you win? Did you lose? Congratulations on win-win! Thanks for sharing your story. Bob, I love how you talk about controlling what you can control, and leaving the results on the scoreboard. What a great mindset, one that works in all paths of life. Miss you and JoAnn. Glad to hear you’re thriving, on and off the court.